For every would-be homeowner who gets the call with a positive response to their latest bid, there are exciting times ahead.As always, there will be plenty of planning and organising still to do to make sure everything goes through successfully. Our advice is to take the initiative and start now by listing every task that stands between you and the day of the big relocation. You can make one of the most important decision right now by booking your relocation with Thomas Firbank. The Thomas Firbank team can assist with your planning by giving some essential pointers and tasks you may not have thought of. The type of relocation service you choose will depend on how many items you’re moving with, as well as more details about each piece of furniture or appliance. Our team will gather as much info as possible as part of our routine assessment process. What’s more, we guarantee to suggest the best value for money removal service to help reduce your costs. Thomas Firbank has an excellent man with a van service that our rivals struggle to compete with. Our large fleet of vehicles makes it possible to accommodate busy days and last-minute jobs. Thomas Firbank’s Man & Van service is the best value for money and efficient removals service in Bath. Every Man & Van service comes with two time-served team members for every job to handle all the heavy stuff. We offer the lowest rates for man and van in Bath, and we operate all over Somerset and surrounding areas. If your location is further away, we are more than happy to relocate you there. Our team will always try and be as flexible as possible to make sure we meet your requirements. One of the advantages of using the smaller vehicles is they handle rural roads better than large vans. Additionally, the man and van vans also easier to navigate through city-centre and rush hour traffic with ease. Even if some unforeseen congestion builds during your relocation, it’s much easier to change route and drive through minor roads with the small vans. For larger loads, we will advise that you go with our Home Removals service which includes the use of a bigger vehicle. It’s possible to do everything in one trip and works well over longer distances, such as national and European relocations. The Home Removal vans are more adept at carrying more significant pieces of furniture and larger appliances. Thomas Firbank has a range of storage options available, and we have a new Student Storage service. In addition to working with students for small-scale storage, many local students also team up with house or classmates to co-share a storage unit. We also offer self storage for people who require regular access to their possessions. And finally, we have container storage units available at our Bath storage facilities. At Thomas Firbank, we try to make sure we have a variety of removals and storage packages to match everyone’s needs. And if we notice that there are instances where a service isn’t available by there is a demand for it, we create a new service. 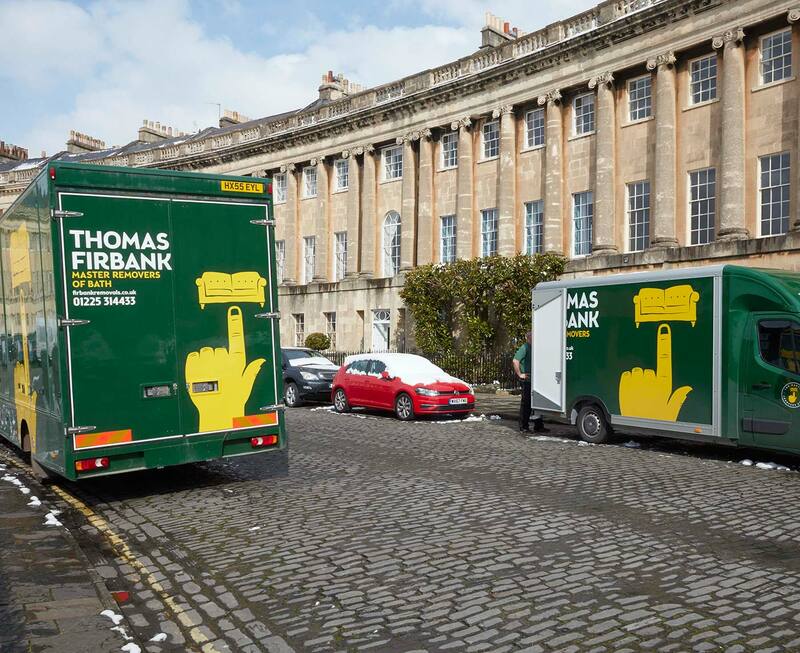 The Thomas Firbank team relocates tens of thousands of people every year in Bath and the surrounding areas. We like to build relationships with our customers so that they use our company for future moves or storage. The only way to do this is to provide the highest level of customer service. For this reason, we not only get repeat customers, they often refer us to friends and family. Thomas Firbank has a variety of vehicles to do any size relocation, and we have the right equipment to move any furniture. No two objects are the same, and that means they all need different sorts of packaging and they need to be transported differently. Our expert team will do everything possible to make sure that your goods are in perfect condition for when you arrive in Bath. The reason we’re now Bath’s favourite removals and storage provider is by providing the highest standard of service possible for every job we sign up for. Everyone at Thomas Firbank understands that every customer has different needs. That’s why we get to know every person we work with as much as we can. This helps us create a picture of what they need from us. If you’re looking for a reliable removals and storage company, you’ll find everything you need at Thomas Firbank. Contact us today; we’re always happy to talk through our range of services, even if it’s just a first inquiry.